If you are a Nana (or a Papa), chances are you’re a Baby Boomer and lived through the “sixties”. Those were the days. Unemployment was 5.5%. A starting teacher’s salary averaged $5,174. A postage stamp would run you 4 cents, and you could wolf down McDonald’s hamburgers for 15 cents a piece. Back then the family unit represented strength. The divorce rate in the 60’s was less than half of what it is today; not the least because our television role models were found in shows like Father Knows Best, Leave it to Beaver and my favorite, Bonanza. Da dadada da daaah dahhhh. As a teen, my best present ever was a “princess phone”. My brother listened to sports with my Dad on a transistor radio. My first boy friend owned a lava lamp – good thing my parents never found out; I’d have been grounded for life! The late sixties brought unrest, protests and acid rock. The weekend festival held in Woodstock, New York in 1969 still has its place in rock history. We wore faded jeans, patterned head bands, tie dye shirts and we handed out daisies while we ate brownies…. Hmmm. Have you looked around lately? Maybe I’m being nostalgic, but everywhere I turn I see smiley faces, peace signs and frayed jeans. Yes, there are heated protests, but they are tempered with a consciousness of commitment to the planet. It all seems to be a bit too familiar. We boomers have lived in interesting times and bring a richness of experience to everything we do … especially when it comes to family. 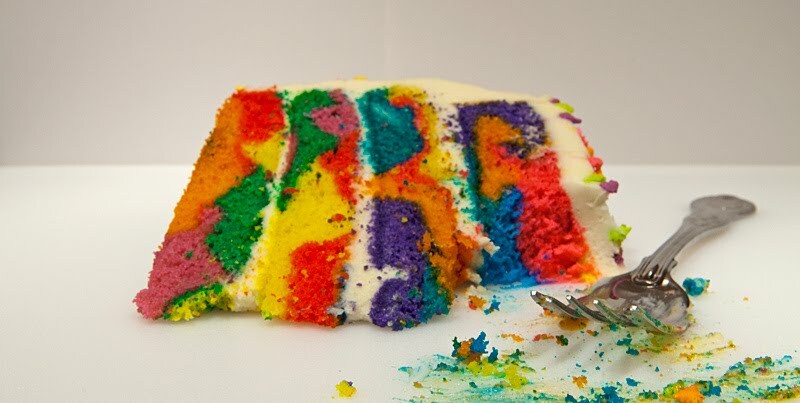 In honor of the “psychedelic sixties”, I offer you my latest FUN baking activity to do with your grandchildren – my Tie-Dye Cake. It’s a blast to make and as delicious as it is colorful. So the next time you are looking for something to do, download the sound track from HAIR to your IPOD, pull out your high-powered mixer, order a couple of neon gel colors and tie dye your cake. If you truly want a blast from the past, take a look at this really cool sixties presentation. Don’t forget to sign up for our NANA NETWORK. We’re committed to raising a generation of fit and happy grandchildren, and we have the experience to do it.